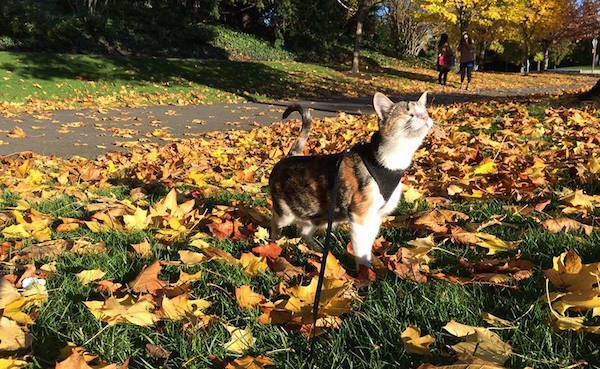 See a video of this cat adopted from an overseas rescue group enjoying the great outdoors. 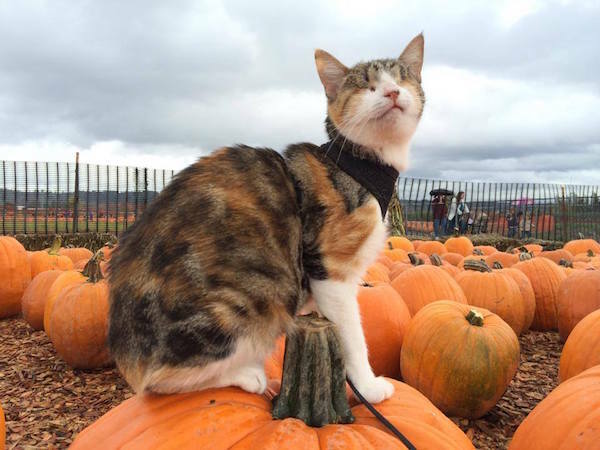 Honey Bee is a cat, born in Fiji, who just so happens to be blind. 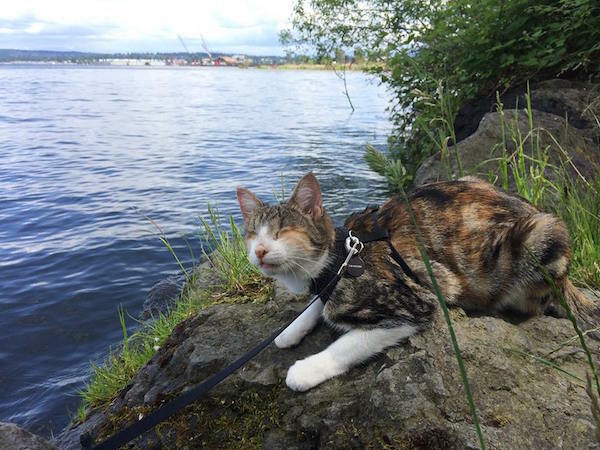 Nevertheless, her lack of functioning eyesight hasn’t stopped this inquisitive feline from hitting the hiking trails in her new forever home in Seattle — an appropriate story to tell in January, which is National Walk Your Pet Month. Now rolling with the motto “Bravery, adventure, cuteness,” she has also become a YouTube sensation after a video of one of her jaunts escalated to viral heights. The story of Honey Bee begins in Fiji, where she was living in the care of the Animals Fiji organization. 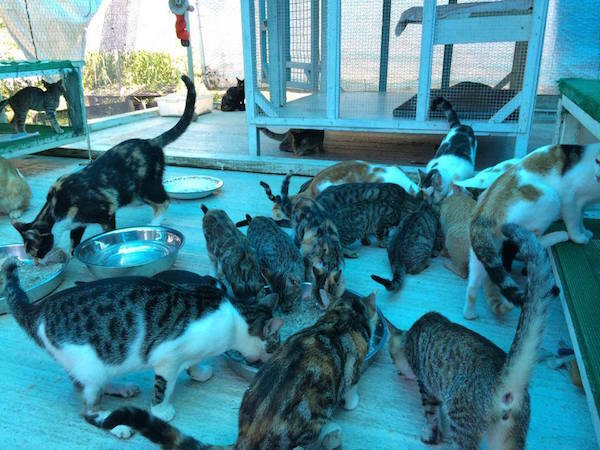 The photo below shows her (up front and center) enjoying a spirited chow session with her other shelter pals. After spotting her at the shelter, her soon-to-be-new parents scooped her up and whisked her back to their own home in Seattle. 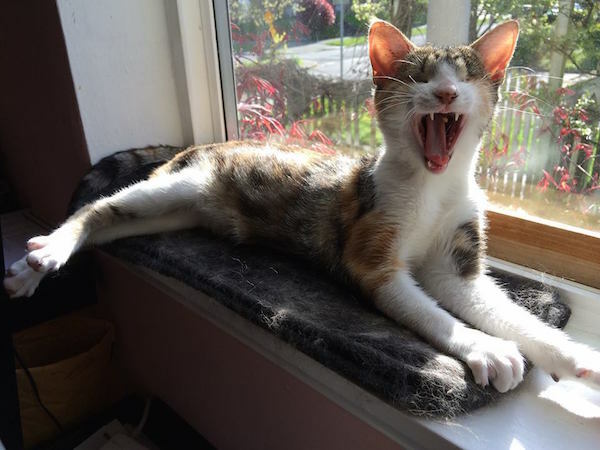 “Honey Bee is a blind cat we met while in Fiji, and despite being disabled, she’s an extraordinary girl,” they soon announced to the world via the wonders of video captioning. According to Honey Bee’s most famous video, when she engages in a hike, she walks at her own pace, sometimes puttering along, often times stopping to nibble and gnaw at some trailside grass. 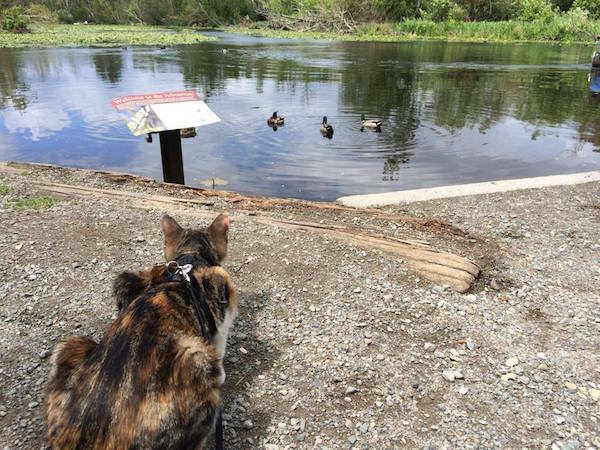 It’s said that she was utterly “enchanted” the first time she heard the sound of ducks. “Sometimes she’s on the trail, sometimes she explores,” is how her parents describe her approach to the bucolic wonderland. Once Honey Bee and her entourage have reached the summit of their trail, the humans pop her in a pet sling and let her nap on the trip back home. You can follow the further adventures of Honey Bee at her Facebook page, and check out one of her hikes in the video below. 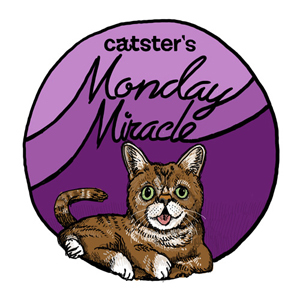 About Phillip Mlynar: The self-appointed world’s foremost expert on rappers’ cats. When not penning posts on rap music, he can be found building DIY cat towers for his adopted domestic shorthair, Mimosa, and collecting Le Creuset cookware (in red). He has also invented cat sushi, but it’s not quite what you think it is.